Kevin Paredes/Photo Editor Peter Napolitano, the director of Auxiliary Services, stands in the University Bookstore. The bookstore is one of the many services on campus that the office supervises, including banking, dining and laundry. If you buy anything on the Binghamton University campus — from a textbook to a bottle of Sprite — it has likely been subject to a discussion in the Auxiliary Services office. Located on the sixth floor of the Couper Administration Building, the office does more than the average student realizes. 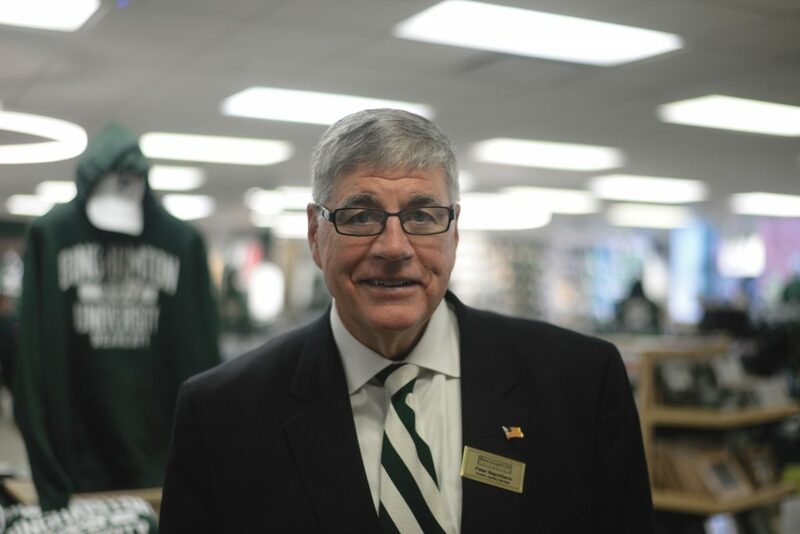 The five staff members of the Auxiliary Services office manage the University Bookstore as well as dining, catering, banking, vending and laundry services. Beyond that, they coordinate the BU Acres project and Campus Pre-School & Early Childhood Center. Peter Napolitano, the director of Auxiliary Services, sees himself as the mediator between the needs of students and demands of vendors that serve college campuses. Student input is important to Napolitano. The Student Culinary Council (SCC), a team of students who meet weekly to advise administrators about food on campus, nutrition and sustainability, drives decisions like changes to retail options in the Marketplace. Since current seniors arrived on campus in the fall of 2014, a lot has changed in campus dining. Chick-N-Bap replaced Wholly Habaneros, Starbucks and Subway arrived in Hinman College and Nite Owl shifted service from four locations to two. Napolitano explained that student feedback from the SCC, a survey and informal meetings with students drove these decisions and others, which included replacing The Diner with Tully’s and Pandini’s with CopperTop Tavern. According to Napolitano, it should take about three minutes from order to pick up at CopperTop. Because CopperTop is an outside vendor, bringing it to campus required a contract process between the restaurant and Sodexo. The Marketplace now has six outside vendors, who have similar contracts to CopperTop’s. All of these involve a careful dance between the interests of the University, Sodexo and the vendor. It usually takes Auxiliary Services nearly a year to complete a contract. Even before the office issues a request for proposal from outside groups, the staff are busy preparing multiple drafts and projecting the impacts. After the request for proposal is issued, groups submit proposals for the project. Then, the office either negotiates the terms or selects a choice outright and offers it for approval by various University entities. The University’s contract with M&T Bank, for example, ends this year (after a one-year extension), and the request for proposal process for a campus banking service is underway. Napolitano is reaching out to other banks that might be interested in competing with M&T for the bid. M&T pays the University $30,000 per year to be on campus. Napolitano encourages students to reach out directly to him with feedback and suggestions, and said that talking to them is one of the best parts of his job.